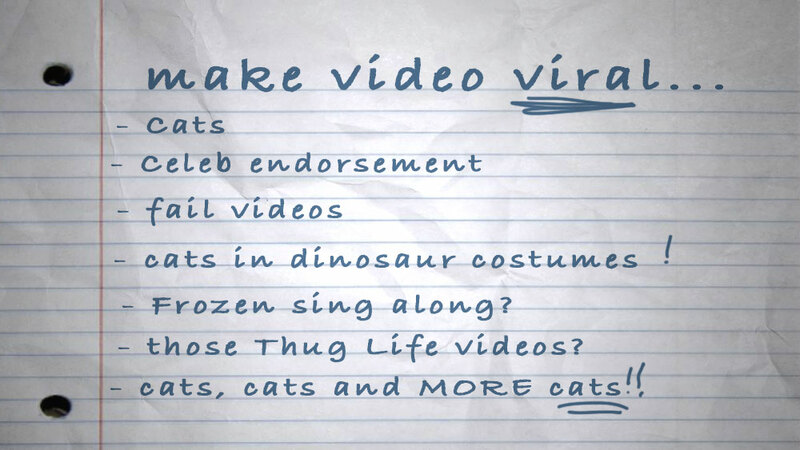 Creating a viral video has become the holy grail of online video. Understandably the worlds biggest companies spend millions trying to create the next viral video sensation. Most people will say there is no way to guarantee getting a video to go viral. There is certainly a set of rules but nothing will give you definite results. In most cases there will be a team of great creative minds able to create something unique, a large budget, access to the top social media trendsetters and all the data to get the video in front of their correct audience. But that’s a lot of elements to get right and even then it might not work. That is why the unpredictability of what will capture the public’s attention makes creating a viral video a challenge. It’s never a sure fire thing and it will usually come down to a the budget and great PR. But when a video of a cat playing piano in someone’s living room gets tens of millions of views plus hundreds of copycats, it really does make people think why cant we do the same? There is of course nothing stopping you creating your viral sensation in this way. For example lets say you sell tents in Cardiff. You somehow manage to train your cat to play guitar and put your logo and latest tent offer at the end of the video. Unbelievably it manages to be seen amongst the thousands of other cat videos and get a million views. Great! Surely those tents will be flying out of the door? Sadly just because the video goes ‘viral’ doesn’t mean your intended consumer base is viewing it. If 90% of your views came from a province in China, how many of those Chinese cat lovers are going to buy their tents in Wales? Perhaps a few thousand of those views came from the UK. That has to be a few hundred sales though right? But perhaps the majority of these British cat lovers aren’t campers and don’t have much call for tents. For most businesses, when making a video you are looking for a return on investment. In other words you want it to influence sales. This could be directly promoting a product with a call to action or encouraging a client to choose you over your competition. For a video to directly influence a buying decision the right people have to see it. If 100 of your ideal audience see your video that explains everything they need to know to make that choice, is that not better than a million people seeing your cat play a guitar? Going back to tents… I actually need a new one for the summer. Come May I’ll be asking Google where I can buy the best tent in Wales. I’ll spend hours looking at all the different camping shops and online retailers. I’ll get frustrated because the pictures are rubbish. Can I trust them not to rip me off? But if I type in “best place to buy tent in Wales” and I see a video that shows a friendly, knowledgeable and trustworthy business that understands my needs, you can bet that’s exactly where I’m going. Video can directly influence your customer’s decision but it will always come down to the right audience seeing it. ‘Going viral’ is all well and good, but it has to engage your target audience. The channels on YouTube that regularly get thousands (or millions) of viewers aren’t the ones who employ tricks to get easy views. They are successful because they are putting out good, informative and/or entertaining content on a regular basis. They know their target audiences and they know what engages them. It’s time more businesses used this approach to give their customer-base content they want to see and not hunting the viral video sensations.